When you’ve finally finished building your home and installing your garden, you might want to take a well-deserved break. But don’t quit just yet. Just like a cake-maker won’t quit until the icing’s on the cake, you need to treat exterior lighting like an essential part of creating your perfect home. It’s time to think about the trimmings. Remember, first impressions count, and the first thing anyone will see of your home will be the front yard. 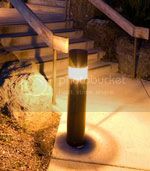 Think of exterior lighting as an opportunity. It can help you to draw attention away from unattractive details while enhancing the best parts of your home and property. This entry was posted on Friday, June 15th, 2012	at 4:32 pm	. You can follow any responses to this entry through the RSS 2.0	feed. Both comments and pings are currently closed.